This is Beate's last sketch for awhile. We are now going to take turns and rotate making them. I hope I can live up to the legend! Luckily, it's not my turn soon! I'm sure the girls will totally keep us busy and having fun! I guess I better get busy and learn how to use photoshop to make sketches! So... I bought this paper from eP for Valentine's projects, then I misplaced it. If you saw my desk, you'd know how easy it was to misplace. I need to take some time and do some organizing. Anyway, I found it, after Valentine's Day of course, and now I'm going to use it up. I love it... the colors are just my style. The snail shell is paper pieced. The mail sack is covered with Fluff. Her eyes and noes raised up with the Glaze Pens. Paper: Irresistable My Mind's Eye, Riding Hood Red, Chocolate Chip, Neenah White. Other: Sakura Glaze Pens, atyou Spica Pens, Kaiser Rhinestones, Fluff, Two Way Glue Pen, Chocolate Poly Twill Ribbon (SU! ), Janome Sew Mini, Scor-Pal, Word Window Punch. And the girls...... I cannot wait to see what they did! Have a great weekend! 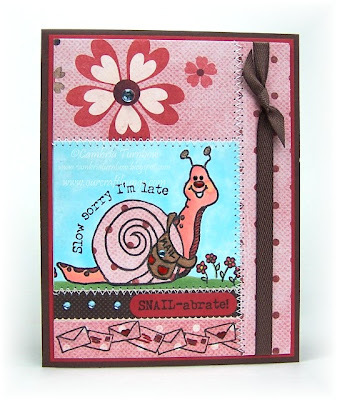 Hope you can sqeeze in some stampin' time and you get to play with the sketch! Thanks for stopping by! Cami, this is absolutely adorable! LOVE that snail! I thought this would have been harder, too. Love your little snail and the bling...darling! Have a wonderful weekend, Cams! 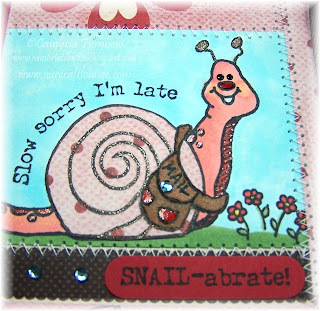 This snail's sentiment is perfect, Cami -- as I rarely get birthday cards in the mail on time, LOL! Very sweet card! Awesome job on the sketch, Cami! Love your coloring on that adorable stamp!! Adorable card, Cami! Love the paper-pieced shell! How stinkin cute is that. All the details in the close up pic have left me speechless! You rocked the sketch girl. OMG! This is too cute my friend! Awww, what an adorable snail guy! I just love your coloring!!! PERFECT!! HUGS! this is a great card. 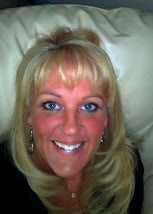 I am in the process of reogranizing as well. I am actually moving my stuff from the laundry to the living room so I can get some more crafting in without being afraid of what my boys are doing to my house hehehe. 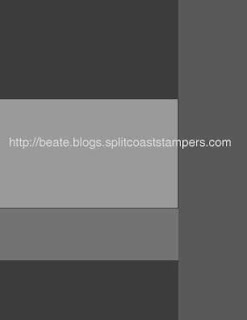 Whispy Patterns Blog Candy Winner! Blog Candy Times 28 Baby!